Microsoft Word 2007 step-by-step instructions on how to change the case of your text, after a miss-type of the keyboard (caps lock). What do you do if you look up at your screen and discover to your dismay that you entered characters IN THE WRONG CASE! It happens. And sometimes Word does mysterious things to letters at the start of sentences and capital letters in the middle of words. What can you do about that? Microsoft Word 2007 is very presumptuous about how it thinks capital letters should be used. You've probably noticed that already. You can't type a lowercase letter after a period. You can't enter a newfangled company name like QUestData because Word refuses to let two capital letters in a row stand. You can't enter lowercase computer code at the start of a line without Word capitalizing the first letter. But, if you've typed uppercase instead of lowercase (and the other way around), you can easily fix it in Word without retyping all the text. 1. Select the text of which you want the case to change. 2. Click the Change Case button from the Home Ribbon tab. Makes the text look like this. 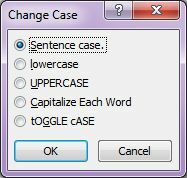 The case is changed to the first letter of the sentence starts with a capital letter, and the rest of the sentence is changed to lowercase. All the text is changed to lowercase. All the text is changed to uppercase. Every first character of a word is changed to uppercase, and the rest of the word is changed to lowercase. mAKES THE TEXT LOOK LIKE THIS, AND i WOULD CHOOSE THIS OPTION IF i ACCIDENTALLY TYPED LOTS OF TEXT WITH CAPS LOCK ON. Changes all uppercase characters to lowercase, and all lowercase characters to uppercase. You can also use the Change Case dialog box by pressing Alt+O ► E.
This option, however, is not a short-cut but more for someone who is familiar with the Word 2003 short-cut keys. Select the text you entered incorrectly and press SHIFT + F3. Keep pressing SHIFT + F3 until the text looks right. SHIFT + F3 changes the characters to all lowercase, to Initial Capitals, to ALL UPPERCASE, and back to all lowercase again.